Message to attend the Protector. Ordered, That Colonel Cooper make Report to the Parliament, as the humble Opinion of this Committee, That an Order be granted to stop all Proceedings at Law against the Petitioners, until the Sixteenth of November next. Ordered, That all Proceedings at Law against Colonel John Haies, and other Soap-boilers of the City of London, whose humble Petition is now depending in Parliament, be stayed until the First Monday of the next Meeting of the Parliament: And all Persons concerned, their Counsellors, Attornies, and Solicitors, are enjoined and required to forbear all Prosecution against them, or any of them, accordingly. A Bill for amending the River of Owse, at and near the City of Yorke, was this Day read the Third time; and, upon the Question, passed. Ordered, That this Bill be presented to the Lord Protector, for his Consent. A Bill for Adjournment of this Parliament until the Day of, was this Day read the First and Second time. The Question being put, That this Blank shall be filled up with "the Twentieth of January next;"
Colonel Jones, Tellers for the Yeas: 48. Sir Wm. Strickland, Tellers for the Noes: 43. So it was Resolved, That this Blank shall be filled up with "the Twentieth of January next." Resolved, That these Words; viz. "and all the Bills, Clauses, and Matters depending in Parliament undertermined, be, from and after the Twenty-sixth Day of June 1657, adjourned until the Twentieth Day of January next ensuing;" be added to this Bill. Resolved, That this Word, "Commonwealth" be inserted, instead thereof. Resolved, That these Words be added, after the Words "next ensuing;" viz. "at which Time all such Persons as have been duly elected and returned to serve in this present Parliament, being qualified according to the Qualifications in the humble Petition and Advice, and not disabled thereby, are required to give their Attendance accordingly." Resolved, That this Bill shall be ingrossed. Ordered, That the Serjeant at Arms attending this House do take Bail of John Browne, to appear here the First Monday after the next Sitting of this House. Ordered, That the Serjeant at Arms attending this House do take Bail of Mrs. Eure and Mrs. Buck, to appear the first Tuesday after the next Meeting of this House. Ordered, That the Report concerning Mr. Scott and Mrs. Scott be made the next Tuesday after the next Meeting of this House. Ordered, That the Report in the Case concerning Colonel Cooke, and others, be made on the Second Thursday after the next Meeting of the Parliament: And that all further Proceedings in the Court of Exchequer, in the Cause wherein Roswell is Plaintiff, and Fursden is Defendant, be staid in the mean time; and that the Parties concerned, their Attornies and Solicitors, do take notice thereof, and forbear all further Proceedings accordingly. Resolved, That the Lord Lambert be excused. Major-Gen. Packer, Tellers for the Noes: . .
Sir Theophilus Jones, Tellers for the Yeas: 71. Major-Gen. Bridge, Tellers for the Noes: 78. Mr. Carey, Tellers for the Yeas: 50. So it passed it the Negative. And all the rest of the Persons named in the said Paper, being put to the Question, were agreed unto. Ordered, That the Lord Broghill, General Disbrow, Major-General Goffe, Mr. Bodurda, Mr. Thomas Smyth, Colonel Twisleton, Mr. Rushworth, Mr. Downing, Sir John Barkstead, Colonel John Jones, Mr. Noell, Major Beake, Captain Blackwell, Mr. Highland, Colonel Mathews, Captain Mildmay, Major-General Kelsey, MajorGeneral Haines, Mr. Maidston, be added to this Committee. Resolved, That the Quorum of this Committee be Seven. Resolved, That the Bill, thus amended, shall be ingrossed. Resolved, That the Bill for Maintenance of the Ministers at Bristoll, be now read. A Bill for explaining a former Act of Parliament, made for the more frequent Preaching of the Gospel, and Maintenance of Ministers, in the City of Bristoll; and for supplying of certain Defects in the said former Act, was this Day read the Third time; and, upon the Question, passed. Ordered, That this Bill be tendered to his Highness the Lord Protector, for his Consent. A Bill for Settling of Worcester-House, in the Strand in Middlesex, upon Cristofer Copley Esquire, and Wm. Hawley Esquire, during the Life of Edward Earl of Worcester; and also such Monies as were due to the said Earl, or Margarett his Countess, from Barnaby Earl of Thomond; in Trust for the said Countess; was this Day read the Third time; and, upon the Question, * * * *. The humble Petition of Barnaby Earl of Thomond was this Day read. A Proviso was tendered to this Bill, in these Words; viz. "Provided that this shall not impeach or invalid the Sale of the Gate-house of the said Worcester-House, by the Trustees appointed for the Sale thereof:"
Which was read the First and Second time; and, upon the Question, agreed to be Part of the Bill. And the said Bill, with the Schedule annexed, being put to the Question, passed. Ordered, That this Bill be tendered to the Lord Protector, for his Consent. The House took up the Debate upon his Highness' Letter, of the 21th of June instant, for Confirmation of the Two Orders of his Highness, and the Council; one touching several Officers and Soldiers of his Highness' Regiment of Foot at James's, the Officers and Soldiers formerly under the Command of Col. Jarvace Benson: Another, on Behalf of Major Wm. Hill, of Guilford. Resolved, That it be recommended to his Highness, and the Council, That his Highness and the Council would please to hear the Parties concerned herein; and to settle the same between them. Resolved, That Colonel White be required to clear the Scaffold, and not to suffer any Person to come there, until the Speaker and Members of Parliament be set there. The House took into Consideration his Highness' Letter, of the Fourth of June instant, on the Behalf of the Officers and Soldiers who served the Commonwealth in Ireland, before the Fifth of June 1649; recommending it to the Parliament, That, towards their Satisfaction, the forfeited Lands in the Counties of Wickloe, Denegall, and Longford, formerly set apart for them by Consent of the Army in Ireland, and Order of the Lord Deputy and Council there, and the County of Letrym, with the MileLyne within the Shannon and the Sea, within the Province of Connaught, and County of Clare, added unto them by Order of his Highness and Council here, might by Act of Parliament be confirmed to the said Officers and Soldiers towards Satisfaction of their said Arrears: And that the Residue of the Debt to them might be secured in equal Way and Manner; and according to the same Rule and Rates with the Remainder of the Debt due to the present Army in Ireland, for Service since the Fifth of June 1649. Resolved, That the said Four Counties of Wicklow, Donegall, Longford, and Letrym, and the said MyleLyne, within the Shannon and the Sea, be not disposed of to any other Use than as aforesaid; but that it be recommended to his Highness and the Council, to put a Stop therein. A Bill for the Adjournment of this present Parliament, from the Twenty-sixth of June 1657, unto the Twentieth of January next ensuing, was this Day read the Third time; and, upon the Question, passed. Resolved, That his Highness's Consent be desired to this Bill. 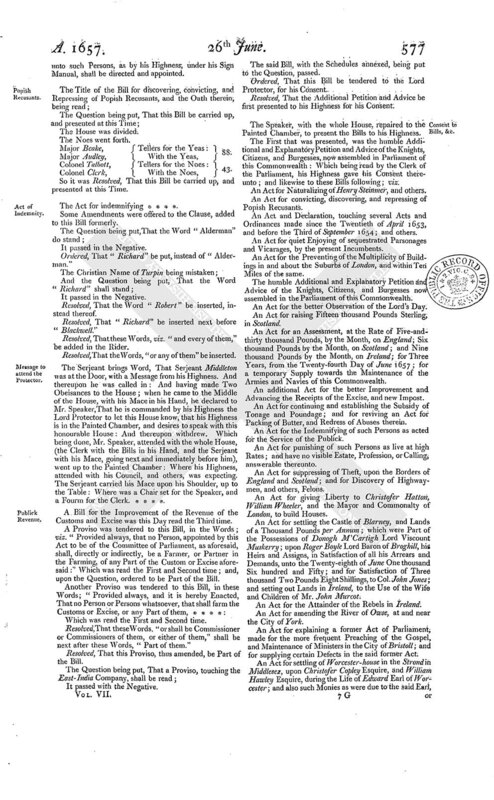 Ordered, That it be referred to the Commissioners for the Custody of the Great Seal of England, by and with the Advice of such of the Judges as they shall think necessary to call to their Assistance, to prepare and frame a Writ, for summoning the Members of the Other House of Parliament to meet at such Time and Place as shall be appointed by his Highness: And, such Writ being so agreed on, the Commissioners of the Great Seal are hereby authorized and required to seal and issue forth such Writs unto such Persons, as by his Highness, under his Sign Manual, shall be directed and appointed. Major Beake, Tellers for the Yeas: 88. Colonel Talbott, Tellers for the Noes: 43. So it was Resolved, That this Bill be carried up, and presented at this Time. The Act for indemnifying * * * *. Some Amendments were offered to the Clause, added to this Bill formerly. Ordered, That "Richard" be put, instead of "Alderman." Resolved, That the Word "Robert" be inserted, instead thereof. Resolved, That "Richard" be inserted next before "Blackwell." Resolved, That these Words, viz. "and every of them," be added in the Rider. Resolved, That the Words, "or any of them" be inserted. The Serjeant brings Word, That Serjeant Middleton was at the Door, with a Message from his Highness. And thereupon he was called in: And having made Two Obeisances to the House; when he came to the Middle of the House, with his Mace in his Hand, he declared to Mr. Speaker, That he is commanded by his Highness the Lord Protector to let this House know, that his Highness is in the Painted Chamber, and desires to speak with this honourable House: And thereupon withdrew. Which being done, Mr. Speaker, attended with the whole House, (the Clerk with the Bills in his Hand, and the Serjeant with his Mace, going next and immediately before him), went up to the Painted Chamber: Where his Highness, attended with his Council, and others, was expecting. The Serjeant carried his Mace upon his Shoulder, up to the Table: Where was a Chair set for the Speaker, and a Forum for the Clerk. * * * *. A Bill for the Improvement of the Revenue of the Customs and Excise was this Day read the Third time. A Proviso was tendered to this Bill, in the Words; viz. "Provided always, that no Person, appointed by this Act to be of the Committee of Parliament, as aforesaid, shall, directly or indirectly, be a Farmer, or Partner in the Farming, of any Part of the Custom or Excise aforesaid:" Which was read the First and Second time; and, upon the Question, ordered to be Part of the Bill. Which was read the First and Second time. Resolved, That these Words, "or shall be Commissioner or Commissioners of them, or either of them," shall be next after these Words, "Part of them." Resolved, That this Proviso, thus amended, be Part of the Bill. The said Bill, with the Schedules annexed, being put to the Question, passed. Resolved, That the Additional Petition and Advice be first presented to his Highness for his Consent. The Speaker, with the whole House, repaired to the Painted Chamber, to present the Bills to his Highness. 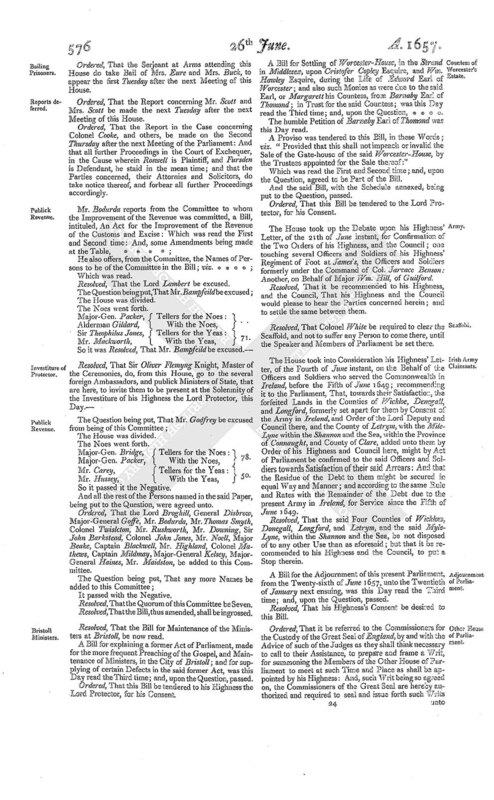 The First that was presented, was the humble Additional and Explanatory Petition and Advice of the Knights, Citizens, and Burgesses, now assembled in Parliament of this Commonwealth: Which being read by the Clerk of the Parliament, his Highness gave his Consent thereunto; and likewise to these Bills following; viz. An Act for Naturalizing of Henry Steinmer, and others. An Act for convicting, discovering, and repressing of Popish Recusants. An Act and Declaration, touching several Acts and Ordinances made since the Twentieth of April 1653, and before the Third of September 1654; and others. An Act for quiet Enjoying of sequestrated Parsonages and Vicarages, by the present Incumbents. An Act for the Preventing of the Multiplicity of Buildings in and about the Suburbs of London, and within Ten Miles of the same. The humble Additional and Explanatory Petition and Advice of the Knights, Citizens, and Burgesses now assembled in the Parliament of this Commonwealth. An Act for the better Observation of the Lord's Day. An Act for raising Fifteen thousand Pounds Sterling, in Scotland. An Act for an Assessment, at the Rate of Five-andthirty thousand Pounds, by the Month, on England; Six thousand Pounds by the Month, on Scotland; and Nine thousand Pounds by the Month, on Ireland; for Three Years, from the Twenty-fourth Day of June 1657; for a temporary Supply towards the Maintenance of the Armies and Navies of this Commonwealth. An additional Act for the better Improvement and Advancing the Receipts of the Excise, and new Impost. An Act for continuing and establishing the Subsidy of Tonage and Poundage; and for reviving an Act for Packing of Butter, and Redress of Abuses therein. An Act for the Indemnifying of such Persons as acted for the Service of the Publick. An Act for punishing of such Persons as live at high Rates; and have no visible Estate, Profession, or Calling, answerable thereunto. An Act for suppressing of Theft, upon the Borders of England and Scotland; and for Discovery of Highwaymen, and others, Felons. An Act for giving Liberty to Christofer Hatton, William Wheeler, and the Mayor and Commonalty of London, to build Houses. An Act for settling the Castle of Blarney, and Lands of a Thousand Pounds per Annum; which were Part of the Possessions of Donogh M'Cartigh Lord Viscount Muskerry; upon Roger Boyle Lord Baron of Broghill, his Heirs and Assigns, in Satisfaction of all his Arrears and Demands, unto the Twenty-eighth of June One thousand Six hundred and Fifty; and for Satisfaction of Three thousand Two Pounds Eight Shillings, to Col. John Jones; and setting out Lands in Ireland, to the Use of the Wife and Children of Mr. John Murcot. An Act for the Attainder of the Rebels in Ireland. An Act for amending the River of Owse, at and near the City of York. An Act for explaining a former Act of Parliament, made for the more frequent Preaching of the Gospel, and Maintenance of Ministers in the City of Bristoll; and for supplying certain Defects in the said former Act. An Act for settling of Worcester-house in the Strond in Middlesex, upon Christofer Copley Esquire, and William Hawley Esquire, during the Life of Edward Earl of Worcester; and also such Monies as were due to the said Earl, or Margaret his Countess, from Barnaby Earl of Thomond; in Trust for the said Countess. 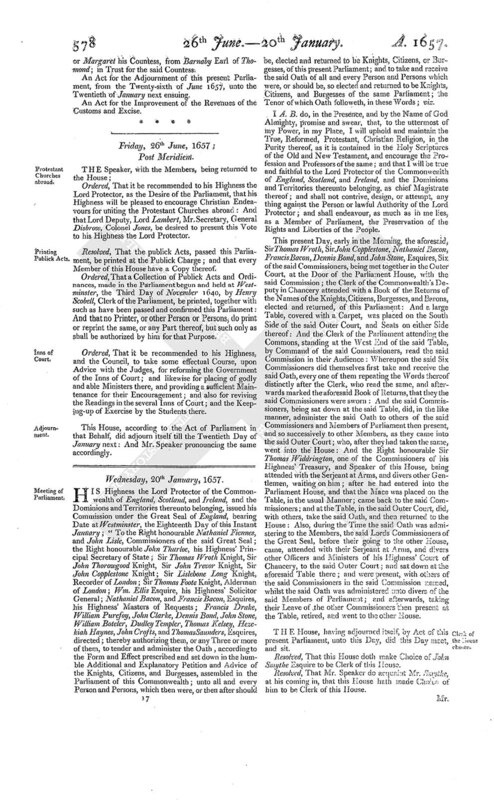 An Act for the Adjournment of this present Parliament, from the Twenty-sixth of June 1657, unto the Twentieth of January next ensuing. An Act for the Improvement of the Revenues of the Customs and Excise. 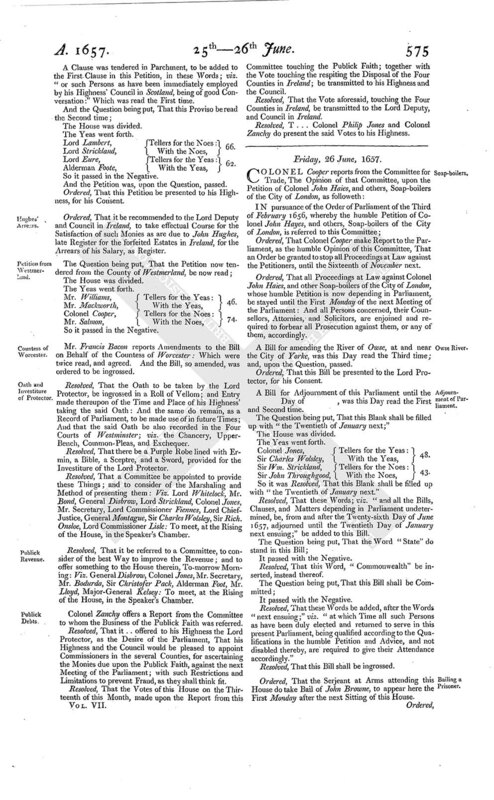 Ordered, That it be recommended to his Highness the Lord Protector, as the Desire of the Parliament, that his Highness will be pleased to encourage Christian Endeavours for uniting the Protestant Churches abroad: And that Lord Deputy, Lord Lambert, Mr. Secretary, General Disbrow, Colonel Jones, be desired to present this Vote to his Highness the Lord Protector. Resolved, That the publick Acts, passed this Parliament, be printed at the Publick Charge; and that every Member of this House have a Copy thereof. Ordered, That a Collection of Publick Acts and Ordinances, made in the Parliament begun and held at Westminster, the Third Day of November 1640, by Henry Scobell, Clerk of the Parliament, be printed, together with such as have been passed and confirmed this Parliament: And that no Printer, or other Person or Persons, do print or reprint the same, or any Part thereof, but such only as shall be authorized by him for that Purpose. Ordered, That it be recommended to his Highness, and the Council, to take some effectual Course, upon Advice with the Judges, for reforming the Government of the Inns of Court; and likewise for placing of godly and able Ministers there, and providing a sufficient Maintenance for their Encouragement; and also for reviving the Readings in the several Inns of Court; and the Keeping-up of Exercise by the Students there. This House, according to the Act of Parliament in that Behalf, did adjourn itself till the Twentieth Day of January next: And Mr. Speaker pronouncing the same accordingly.